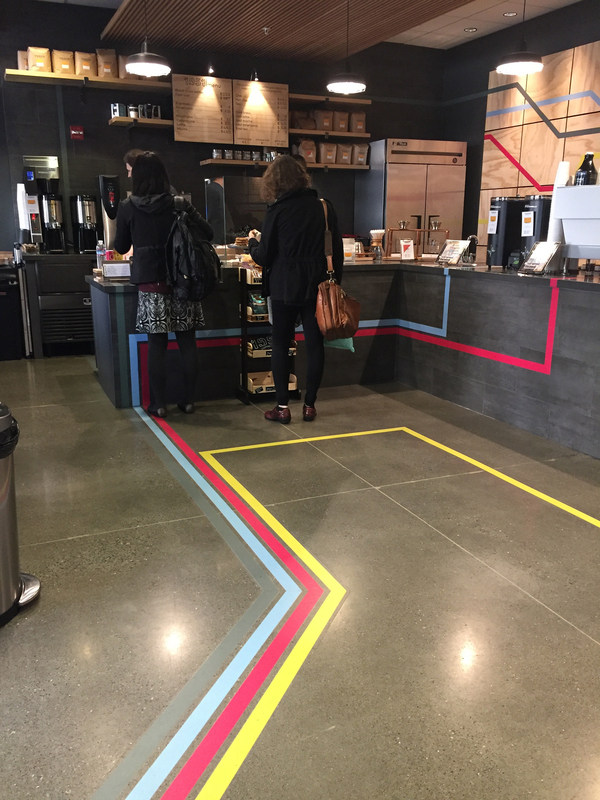 When baristas hand over your low-fat latte, you probably don’t consider the paths that brought them to stand across the counter from you. 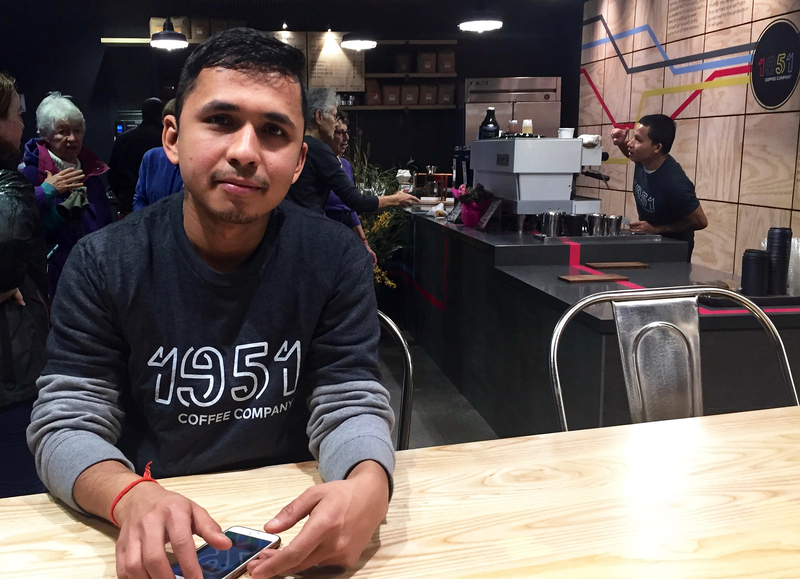 But at 1951 Coffee Company, the Berkeley café that opened in January and is staffed entirely by refugees, the baristas’ life journeys are actually the point. Before founding 1951 Coffee Company with Rachel Taber, Doug Hewitt’s job as an employment specialist at the International Rescue Committee (IRC), included preparing refugees for job interviews. He repeatedly witnessed a disheartening pattern: on the way to the interview, the refugees would chat with him personably. “But when prospective employers started asking them questions, they would get nervous,” explains Hewitt. “Their English would become even more ‘broken.’” They also might lose points for the way they answered typical American job interview questions, such as “Where do you see yourself in five years?” While this sounds like a simple query, an honest reply is not necessarily what the employer is looking for. Digital barriers add even more challenges today, as most applications must be completed online. When it asks for previous job experience, the location can only be selected from a list of the 50 states. There is no field to enter international job experience and without the conventional list of references, most prospective employers just don’t want to take the risk of hiring a refugee. Hewitt would discuss these concerns with Taber, a co-worker at IRC, over a cup of coffee. 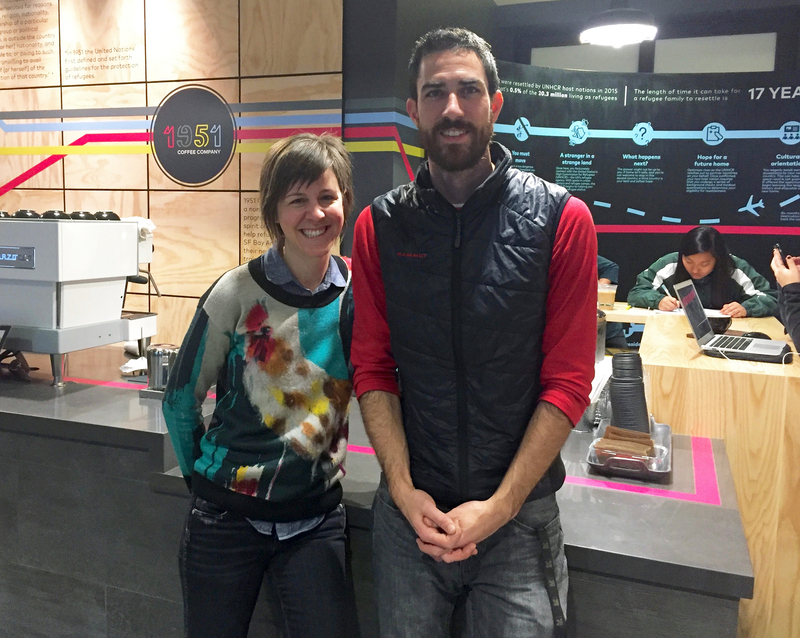 Their shared love for the caffeinated beverage led to charts listing their ratings of nearby coffee spots and a jointly owned espresso machine for their office. “Okay, you can call it an obsession,” says Taber, smiling. They began to envision a place where refugees could be trained and supported while gaining the experience that could further their work lives. Hewitt, who had experience working as a coffee roaster, imagined many opportunities this field could offer refugees. 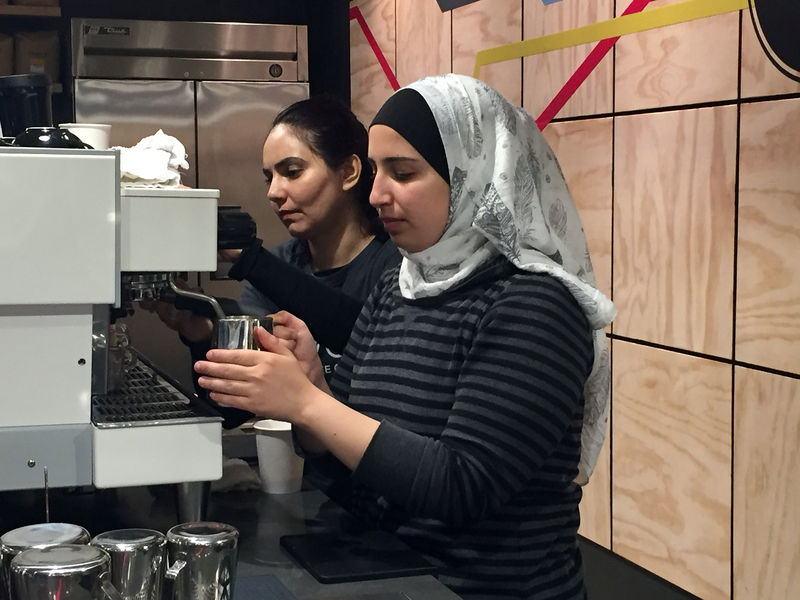 They agreed that refugees + café seemed like a winning combination. 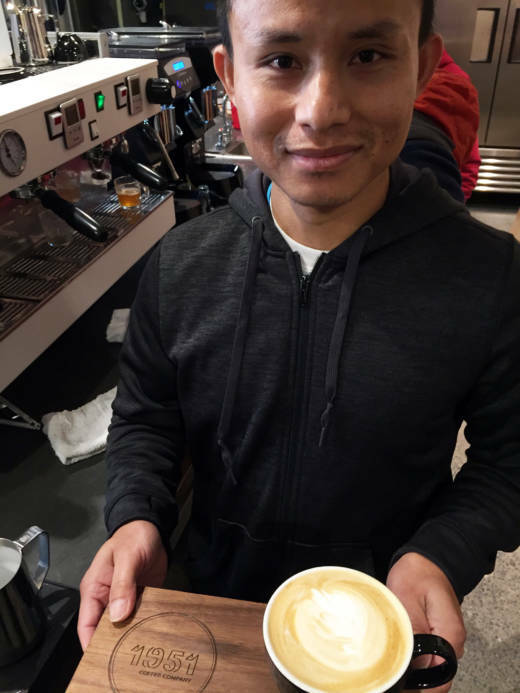 Taber, whose background is in fundraising, saw the Bay Area as the perfect place for this kind of social entrepreneurism, with its longtime support for immigrants and refugees coupled with an appreciation of high-end coffee culture. Though they faced numerous hurdles, many organizations and individuals (including the First Presbyterian Church of Berkeley, who owned the space where their restaurant is housed and the Montaag design firm) appeared --almost miraculously-- to offer support. 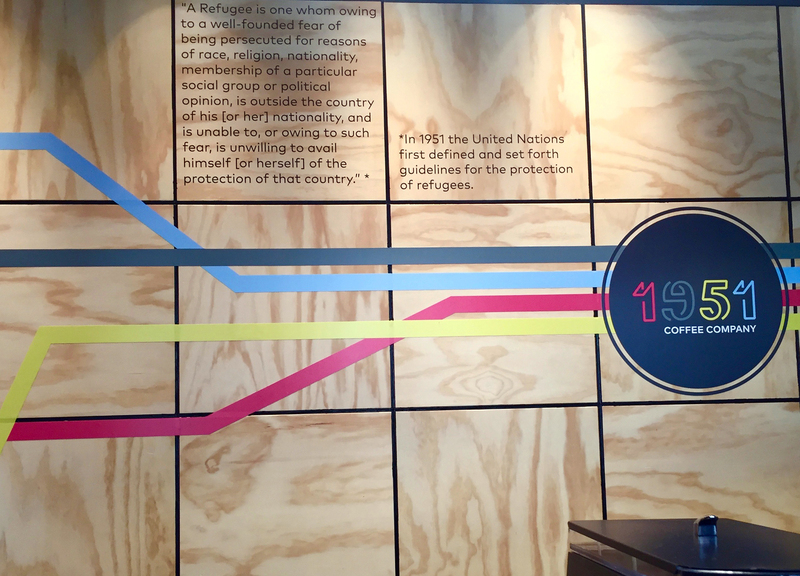 The year 1951 in the café’s name refers to a convention held by the UNHCR in Geneva in 1951. During that convention, the word “refugee” and the guidelines for protecting them were first defined. That fact and many other details about the long arduous journey that refugees face are illustrated with artwork that lines the walls of the café. “We want this to be a space for education and for starting dialogues, says Taber. Another employee is slowly and carefully steaming milk. Nazira has a shy smile and a workable command of English, even though she has only been in the U.S. for two months. Before she left Afghanistan, she was a journalist for TV, radio and newspapers and also worked with the AJSC, an organization in Afghanistan that advocates for female journalists who face a special set of challenges. Her husband had applied for and received a Special Immigrant Visa, which is usually given to those who have provided valuable service to the United States Government. Although in her job as journalist, Nazira spent one month traveling around the U.S. in 2014 to report on our midterm elections, that exposure did not prevent the difficulties she has had in adjusting. Leaving her home and family and the ensuing culture shock made her ill for the first three weeks she was here. She felt physically safe but mentally upset and cried often. The stress was extreme. “We had nothing here, “Nazira says. “I had so many things in my heart but no one to talk to about them.” She went to IRC for help and found Hewitt and Taber. “I needed a job. I wanted to get out of the house and stand on my own two feet. When I met Rachel, she was so kind. 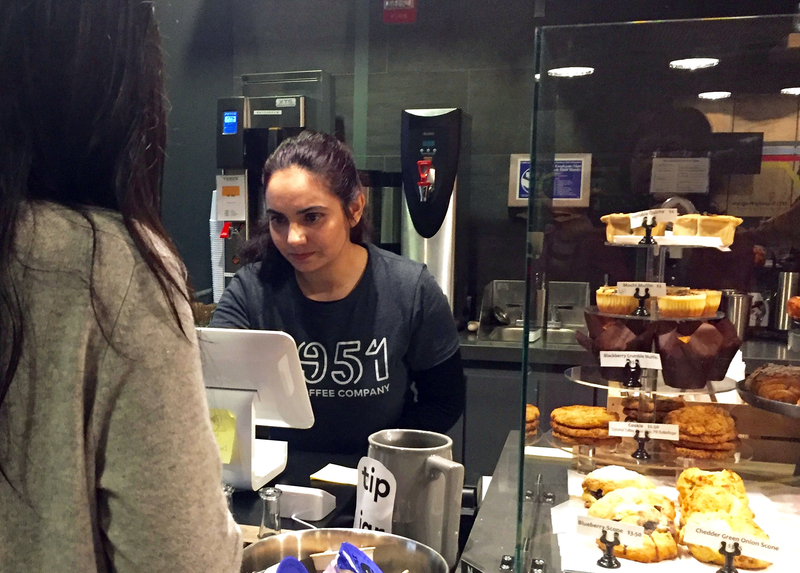 I didn’t know anything about coffee, but she hired me.” Nazira learned how to prepare coffee plus the cultural code of American customer service. But she still finds many challenges in her new home, including transportation. “We wait such a long time for the bus every day. Why don’t the citizens try to do something about this?” Nazira asks. She wants to go to college, but cannot afford to do so until she has been a resident for one year. 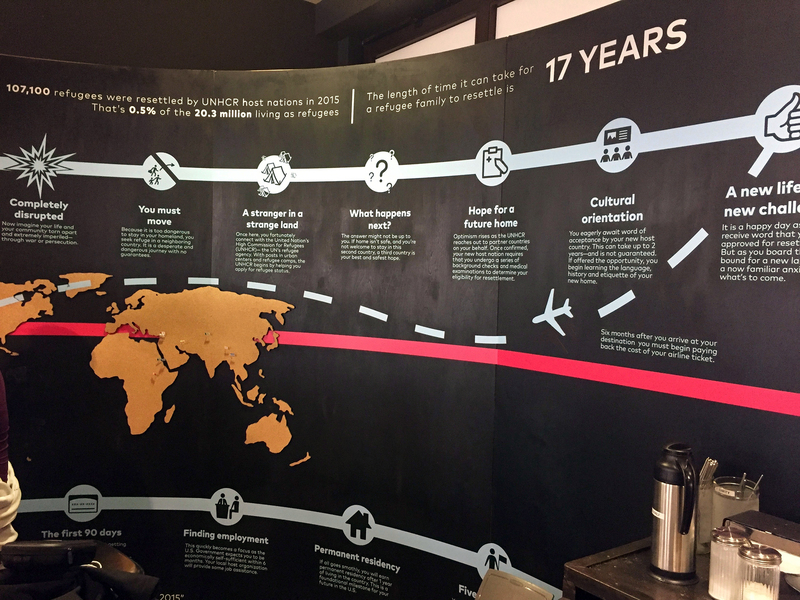 The large diorama on the wall shows the refugee’s long path to resettlement, which can take from 5 to 20 years. That latter number was the case for 1951 Coffee’s senior barista, Meg, who is in a constant state of motion around the cafe, supporting other employees, checking the bathroom, making sure everything is running smoothly. When Meg was 2 years old, his family fled Bhutan and spent the next 20 years in a massive Nepali refugee camp with 1,400 other families. Life was hard: they were only allotted rice and a few vegetables and had to cover their flimsy huts with plastic to withstand the summer rains. In 2007, after a fire quickly spread through the thatched bamboo-covered huts in the camp, his family had to live in the jungle for two months. Meg went to school in the camp and became a teacher of English, math, and science. He probably never imagined that eventually, he would be teaching other refugees about coffee culture in the U.S.
Long before the birth of the 1951 Coffee concept, when Doug Hewitt was just volunteering with IRC, he hired Meg to occasionally package the coffee he was roasting for his job at Boot Coffee Consulting in Marin. He also saw how Meg tried to get steady work but was repeatedly turned down for his lack of skills. Finally, Chipotle, who had a relationship with IRC, decided to open several new restaurants, including one at 50 California in San Francisco. Since it was a new location they gave all their new hires, including Meg, a week of training. He became one of Chipotle’s best workers and was eventually offered a management position. Witnessing the way that training made all the difference, Hewitt asked Meg if he could recreate that experience for the refugees at IRC. Hewitt set up a volunteer “food service training” program at IRC, which only happened on intermittent Fridays. While he and other volunteers offered English classes, Meg handled the hands on training. 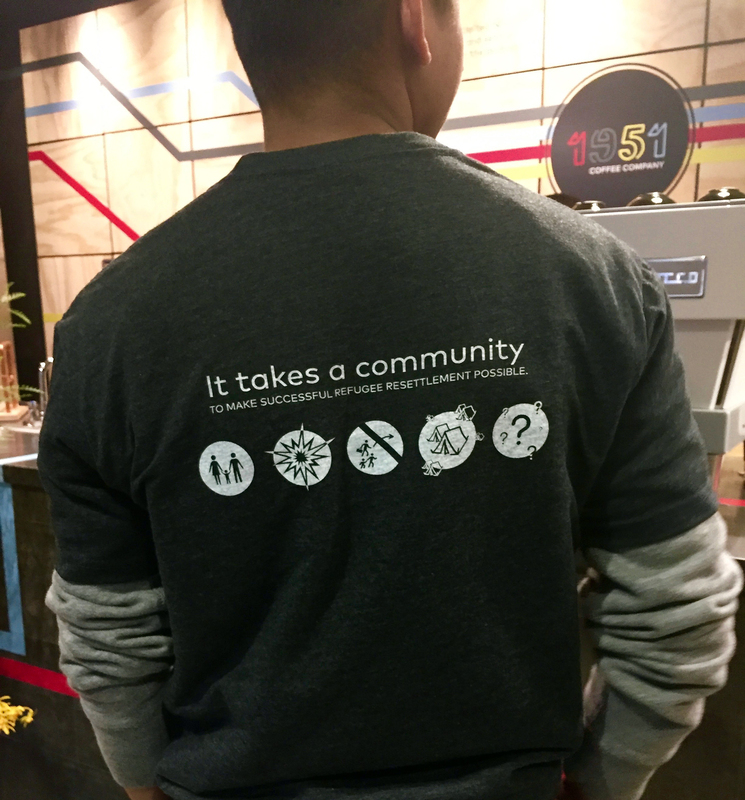 When Chipotle offered him a job as a manager, Meg had to turn it down because the long days required would not have allowed him to fulfill his other obligations, which included volunteering at IRC to help newly arrived refugees. He was also attending Laney College, taking classes in English, math and business, taking care of his parents and playing soccer. He recently married Indira, a woman he knew from the camp. But Indira lives in Vancouver, where she takes care of her parents, while Meg and his parents live here. The couple meets in Seattle when they can. “Some groups try to raise money for refugees by only highlighting their vulnerabilities,” says Hewitt. “We were inspired by these amazing people, their resilience and determination to work through challenges together as a team.” He and Taber hope this model can be replicated across the country.